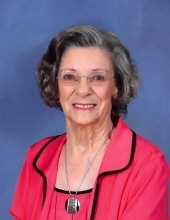 Patricia Ruth Sproule “Pat” Grant of Hopkinsville, KY passed away at 11:25 p.m. on Tuesday, February 5, 2019. Pat was born on July 18, 1929, the last member of the Dudley Taylor Sproule and Georgia Wallace Sproule family. She was a native of Central City and Crofton, Ky.
She was a past Worthy Matron of Carrie Hart Chapter O.E.S. and Worthy High Priestess of Acacia Shrine W.S.O.J. Pat graduated from A.P.S.U in Clarksville, Tn. She retired as a teacher at Christian County High School in 1978. She was a member of the First United Methodist Church. Her love of politics brought much entertainment to her home. She served on the Executive Committee for the Christian County Democrats and was a recipient of the Edward T. “Ned” Breathitt Award in 2008. Pat was preceded in death by her husband, L. Ray Grant in 1991, her son, Daniel Ray Grant in 1999, and her grandson, Matthew Grant Morse in 2005. She is survived by her daughter, Penny Ree Grant, whom she lived with. Also, her granddaughter, Christi Grant Wood. Great granddaughter, Victoria Lynne Wood of Murray, KY. and Great Grandson, Connor Alan Wood, Bowling Green, Ky.
Hughart, Beard and Giles Funeral Home is in charge of services. Visitation will be Friday, Feb. 8th, 2019 from 4:00 p.m. to 8:00 p.m. Funeral services are scheduled for Saturday, Feb. 9th, 2019 at 2:00 p.m. Burial will follow at Ridgetop Cemetery, Crofton, Ky.
Memorial contributions can be made to Pennyroyal Hospice, 220 Burley Avenue, Hopkinsville, KY 42240. To plant a tree in memory of Patricia Ruth "Pat" Grant, please visit our Tribute Store. "Email Address" would like to share the life celebration of Patricia Ruth "Pat" Grant. Click on the "link" to go to share a favorite memory or leave a condolence message for the family.